Sepawi - Lets do business? Hamed Sepawi is the chair of both Ta Ann and the Sarawak Electricity Board. Both have multi-million dollar deals with the Tasmanian government. 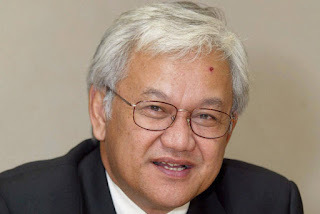 Sepawi's cousin is Sarawak despot Taib Mahmud. Sepawi has many other financial interests. He is part owner of a Sarawak logging company called Samling. His Australian wife even owns a handbag shop in Sydney's Neutral Bay . Samling has been ranked by Global Witness as one of the world’s most notorious logging companies. Samling has surfaced in Liberia as a business partner to a Liberian logging company called Atlantic Resources. Atlantic Resources is owned by Mr. John Gbessay, a long time business partner of former Liberian President Charles Taylor who has been convicted for war crimes and crimes against humanity. Investigations reveal that Mr. Gbessay was one of those behind the notorious Oriental Timber Company that destroyed the Liberian forest and squandered the country's natural resources. OTC is noted for committing gross human rights and environmental abuses in Liberia, arms trafficking and illegal trade in the region. Oriental Timber Company was named as one of the logging companies associated with Taylor in a UN Security Council Report. Liberia's new President Mrs Johnson-Sirleaf has surrendered almost a quarter of the country to foreign logging companies, endangering the largest surviving rainforest in West Africa. Two companies, Atlantic Resources and Alpha Logging have been the main beneficiaries of the permits. Both have 'significant corporate ties' with Samling. In 2010, the Norwegian government pension fund divested from Samling after finding the company had carried out illegal logging in Sarawak. Last month, President Mrs Johnson-Sirleaf 'suspended' Moses Wogbeh, the head of Liberia's Forestry Development Authority, who had signed the permits. A statement from her government said an 'independent' investigation would examine the awarding of permits, and promised no more would be handed out until this was complete. According to the Global Witness report Sepawi has a 60% stake in Samling. The company was set-up with loans from the HSBC Bank, itself discredited by a US Senate Committee for allowing 'moneylaunderers, drug dealers and suspected terrorists to move their money into the United States.' Whatever the continent, whatever the country, their game is always the same. Use corrupt local politicians to remove the forests and sell them. Then convert the land to palm oil plantations. Sepawi doesn't worry about indigenous people or if they are dependent on the forests to survive. Thats the Sarawak way of doing business. Ta Ann's Tasmanian operation is just a small part of the global market in non-FSC, non sustainable forest products looted by corrupt governments and the 'Taib Timber Mafia'.